Theophilus means friend of God. We can't be sure whether the name refers to an actual person or if it is symbolic to speak to each person who is seeking to live as a friend of God. 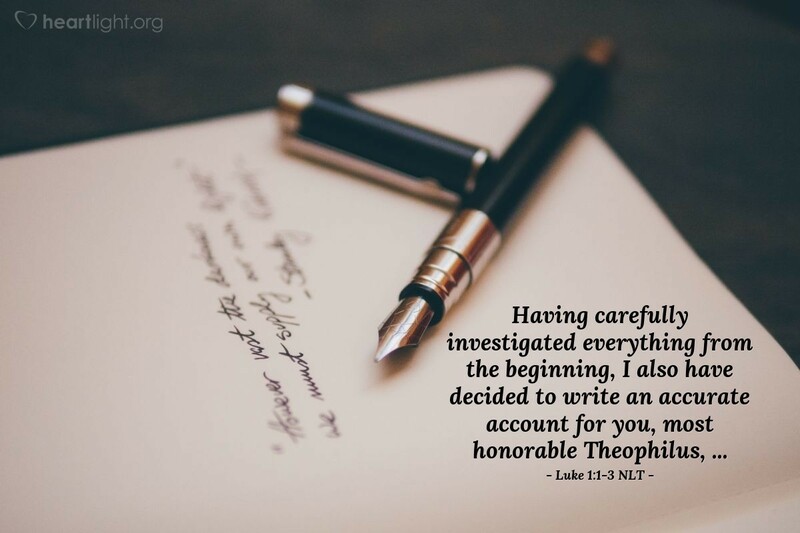 In either case, Luke wanted us to know that his gospel was written after other accounts of Jesus' life had been written or circulated in stories. As he began his gospel, Luke also emphasized the great care he took to be accurate and thorough in his account of Jesus' life and ministry. He wanted us to know he was writing from the perspective of the work God accomplished through Jesus' life. Then, he invited us, his readers, to seek after God and to honor him with our lives. Jesus promised that if we seek after him, we will find him! Let's accept both Jesus' and Luke's invitations to open our hearts to God's work through Jesus our Savior! Father, as I start this New Year, I want to know you more fully through what Jesus did in his earthly ministry so that I can serve you more fully in my daily life. Please reveal Jesus to me as I study his life from the Gospel of Luke this year. In Jesus' name, I pray. Amen.